Apple iOS 10 evolves! Let us dig into iOS 10 and see what’s new? iOS 10, the new version of Apple’s operating system for iPhones, iPads was made available to public from 13-September-2016. It is not as vibrant and new as iOS 7. However, still you will feel an improvement in the overall experience and will find many new features. Apple has focused its efforts mainly on Lock screen, Message app, Control center, Photos, Siri and Music. The lock and notification screen has been redesigned letting the users to access their widgets quickly in a friendlier way. Notifications continue to be more interactive in a 3D touch – capable phones like iPhone 6s or 7 and one can even directly interact with text messages in the lock screen. Camera app can be easily accessed by swiping in from the right and things like weather, news, upcoming events, maps can be accessed by swiping in left. A new feature called Raise to Wake is equipped with iOS 10 phones where the phone’s light will turn on and lock screen will be displayed when the user lifts it. This is the Apple’s most –used app on iOS and anyone would love the changes iOS 10 has brought in the Message App. The newly added emoji are all fun with loads of GIFs and they are three times the size in messages. The invisible ink message can be read only after the recipient swipes across it – very helpful in public when eyes are on you or to send sweet surprises to friends and family. One can also send any hand-written message, or a bunch of balloons or laser lights or fireworks or shooting stars or hearts! Game section lets any user to play simplistic board games with friends through text conversation! How cool it will be to play chess with your friend sitting miles apart. Swipe up from the lock screen and go to the ever useful control center. Instead of one page you will find 2 pages now! First page still holds all your familiar settings like airplane mode, Bluetooth, Do Not Disturb, Screen Rotation lock, Air Drop, Night Shift and also Flash Light and timer. Second page has all the media controls. One can play or pause music, audiobooks, podcasts directly from here. The bottom of screen lets you switch between all the airplay devices through your Wi-Fi network. 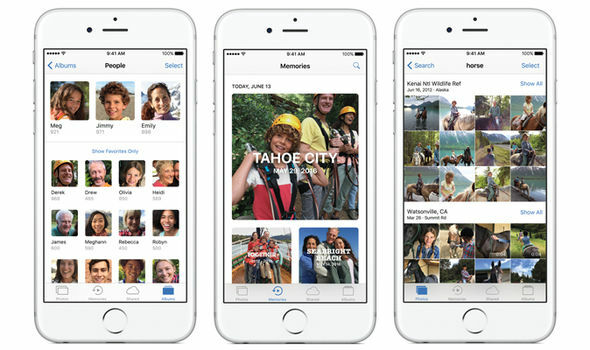 Photos app now has search facility. If you want to look for photos related to food, type food in the search tab and you will be able to look at photos of all kind of eatables being displayed! Auto generated slideshows of pictures or memories will be created. One can even set the music mood and length of these videos. A big news for all the apple users having iOS 10- Apple is finally letting its users to delete preinstalled apps like Stocks, Tips from their phones and iPads. Technically all the user data is deleted keeping the apps hidden, consuming very less space but still, this is very helpful in managing space. Apple’s Music app has received an update with a visual redesign and lyrics for songs. Also, one can continue listening to Music while taking photos. With this new app that comes with iOS 10 one can control home appliances and devices directly through iPhone or iPad. For example, one can switch on/off the lights, lock front door or set room temperature by connecting the devices to the phone home app. If you are already prompted to upgrade go ahead and install to enjoy your new iOS. If not, head to the General section in Settings app to manually initiate the installation. Connect your phone to a charger while going through this process unless your battery is full. Have fun with iOS 10. Everything You Need To Know About Snapchat!